Updates to Primitivo's profile since your last visit are highlighted in yellow. High School was a bittersweet time for me. While I enjoyed my classes, there was one which struck cold fear in my heart. It was Advanced English with Mr. Summers. Mr. Summers was not the problem, it was me. I lived in constant terror of being asked to read aloud in class. You see, I could not read two words in a row. As I looked at the written page, the letters appeared to jump around within the word itself, to the point that I could not recognize the word. Everyone assumed that it was due to English being my second language. My main problem was that I was, and still am, horrendously dyslexic. Mind you, I did not say I was stupid. I said I suffered from severe dyslexia. It was a lucky thing for me that I was not tested and diagnosed with such an ailment! I would have been stuffed into the deepest, darkest catacombs of Special Ed, and would never have seen the light of day, let alone a high school diploma. I later diagnosed myself while I was studying Special Programs and working on my Public Schools Mid-Management Certificate. I went to college, and earned a couple of degrees. I was a band director for a while, then went into school administration, and after some thirty years in the TX Public School System, I retired. I now live in Harlingen, Texas, with my beautiful wife, Kathleen. She was also a school teacher with thirty three years under her belt. She was a choir director and is a super organist/pianist. She retired at the end of the 2015 school year. Presently, I am the choir director at First Methodist Church of San Benito, TX, and Kathy is my accompanist and church organist. We are having a lot of fun! My senior year I was the Drum Major for the Tiger Band. That was a fun position, but it was a tough job which carried a lot of responsibility. I used to have something funny happen to me at every football halftime show. The show would start with me on the ten yard line, in front of, and facing the goal posts. The band would be split in half, with each half of the band on opposite sides in the end zone. Here's the funny part. I would go TOTALLY blank!!! I could not remember one little bitty part of the show. The only thing I knew was that I had to give a forward march to the band. I would give the command, and the instant that the drums hit the first stroke of the marching cadence, the whole show would come back to me. I would be fine from that point on. That little scenario would play out before every football halftime show. No matter how well I prepared myself, that little drama would always occur at the start of every halftime show. Go figure! What did you always want to do that you haven't done yet? I've always wanted to learn fencing, and I always wanted to get in the ring and fight a bull. I've gotten too old to do either one of those things! I don't move as fast as I used to! For those of you who ever heard me read aloud in class, I would guess that you would be surprised that I actually attended college and earned a degree; in fact, two of them! What is the farthest you have been from home? Although I have traveled a good part of this world, Saigon, Viet Nam would be the farthest away from home that I have ever been. Any famous or interesting people you have met? I met the actor Fess Parker, better known as Davy Crockett. I got to be buddies with General Robert Delashaw. He was a P-47 Fighter pilot and 405th Fighter Bomber Group Commander, WWII. While in Viet Nam, I met Colonel Patton, son of General George S. Patton. Colonel Patton was the commander of the 101st Air Borne Screaming Eagles. The Colonel went on to retire like his father. Primitivo Alvizo Alvizo posted a message. My thoughts and prayers are with both you and Linda. God bless both of you. 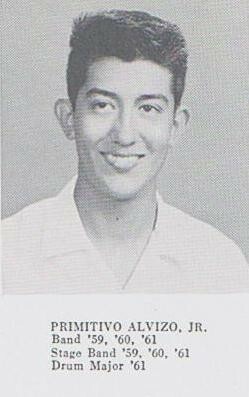 Primitivo Alvizo Alvizo has a birthday today. Primitivo Alvizo Alvizo posted a message on Roy Aja's Profile. Primitivo Alvizo Alvizo posted a message on Jimmie Wright's Profile. Don’t know how all the ?????? Got there!!!! Primitivo Alvizo Alvizo posted a message. New comment added. Primitivo Alvizo Alvizo added a comment on Hyla Gean Pricer Lott's Profile. Primitivo Alvizo Alvizo added a comment on his Profile. Dude! Happy belated birthday!!! Things been crazy around here and I've dropped the ball on a lot things! Knowing you, I know that you had a HAPPY day! Primitivo Alvizo Alvizo joined via Class Connection Facebook app.